Needing a win to lock down a first-round bye in the playoffs, the Minnesota Vikings came out strong Sunday, jumping out to a 14-0 lead over the Chicago bears en route to a 23-10 victory that left the team at 13-3 for the season, cementing their spot as the NFC No. 2 seed. RB Latavius Murray scored on a pair of 1-yard touchdowns early in the game and had 111 total rushing yards in the game. For the Bears, only WR Dontrelle Inman (5 catches for 94 yards) topped even 30 yards from scrimmage, with the team’s lone touchdown coming on a second-quarter punt return by Bryce Callahan. Keenum had another solid performance for the Vikings, which has been the winning formula for them. He did not put the ball in danger once on 32 dropbacks. Keenum struggled under pressure, just completing five passes on nine attempts and taking two sacks, earning a 60.9 passer rating. Keenum did most of his damage in the middle of the field, completing 16 of his 21 passes inside the numbers. 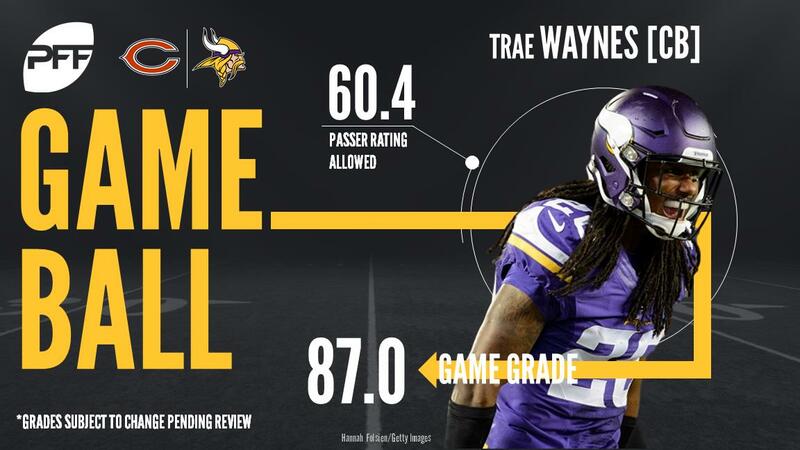 Waynes’ coverage numbers took a bit of a slide from halftime but still posted another impressive display to cap off a breakout season in his third year. At halftime Waynes had allowed zero catches on three targets with a pair of pass defenses. By the end of the game he’d allowed 3 catches for 52 yards, but his performance was still overwhelmingly positive, largely erasing the Bears’ passing game in his direction whenever they tried to come out of their conservative shell. It’s back-to-back weeks with a safety earning a grade of 90-plus for the Vikings, with Sendejo taking the honors this week. It could have been even better for Sendejo had he found a way to bring an interception on Tarik Cohen’s trick pass but he still wrapped up the game with that pass breakup and a trio of stops, a season high in stops and his most since Week 17 of the 2015 season. Inman came alive late in the game, exploiting Xavier Rhodes after the Vikings’ cornerback left the game briefly and didn’t seem himself after he came back before ultimately leaving again. Inman racked up four grabs for 74 yards against Rhodes and also drew a pass interference penalty from Rhodes with 4 minutes left in the game. Another game of highs and lows for Trubisky as he put a cap on his rookie season with another defeat. Retreating into his own end zone off a quick drop to take a safety was an ugly play in isolation, but there were promising signs when he did more than throw swing passes and flat routes. Trubisky’s most productive area of the field was between the numbers more than 10 yards down the field. He hit five of his seven targets in this area of the field for 94 yards, more than half of his production on less than 20 percent of his passes. Amos capped off his fantastic season with another solid performance. Against the run, Amos was the best defender on the team with an 80.7 run-defense grade. Amos also allowed only three receptions on three targets for only 33 yards for a 77.9 coverage grade. His overall grade was the highest for the Bears on the day. Jackson was by no means outstanding, but he put together another solid performance against the Vikings, capping off a good rookie year. Although, Jackson is mostly deployed as a deeper free safety, he did not allow a reception all day and finished with a 78.2 coverage grade. While there are many areas in which the Bears need to look for improvement, they can feel good about their safeties going into the 2018 season.